We use globally recognized premium Creapure® raw material made exclusively in Germany. The trademarked quality combines maximized purity and maximized efficacy with a perfectly balanced dosage. Some creatine monohydrates from China and Eastern Europe display poor biocompatibility and insufficient solubility. Quality Creapure, on the other hand, creates a crystal clear powder with the highest degree of purity. No, capsules don’t have to be made of processed porcine and bovine offal. In keeping with our purely plant-based raw materials, we use vegan capsule shells. The origin? 100% cellulose fibers from natural, renewable raw materials. Nutritional supplement to enhance athletic performance. 1Nutritional values will differ when a base other than water is used. A varied and balanced diet and a healthy lifestyle are essential. Only suitable for adults who engage in intense physical activity. Positive effects can be observed from a daily intake of 3g of creatine. Capsules: Take 4 capsules a day with plenty of liquid (water or fruit juice). Powder: Dissolve 3 g of powder (approx. 1 teaspoon) in at least 300 ml water or fruit juice. Preferably immediately before exercising. Make sure to drink plenty of fluids. We recommend drinking at least 2.5 - 3.5 liters of water a day when taking creatine on a regular basis. We recommend taking creatine with enough liquids and fast-acting carbs. Our tip: Mix water and fruit juices and drink at least 300 ml of liquids. To get the maximum out of your creatine intake. this creatine is great. it´s vegan and i really see some results. The product quality meets my expectations . Just added it to my shopping cart. Can't wait to try and see results. My body seems to handle these capsules very well. Definitely a high-quality product that is worth paying the price for it. I have tried many different products to support me with muscle growth and during practice. Finally found what I was looking for. Effect and quality are amazing. Who should use creatine capsules? Creatine capsules are easy to dose and easy to carry around with you, making them one of the most popular supplements for muscle building. Thanks to their compact form, the capsules can be taken anywhere so that they are always at hand. This makes them the ideal companion for training, work or long trips. The active substance creatine is widely used both in competitive sports and amateur sports and is one of the most researched substances. Creatine capsules are effective for quick, intense workouts and are ideal as support for weight training or team sports. The pharmaceutical form of creatine capsules is subject to particularly wide variations in quality. The biocompatibility of creatine capsules is closely linked to the quality of the raw materials and the nature of the capsule (vegan vs. animal-based capsule). In the world of creatine capsules in particular, a large number of inferior monohydrate products produced in Eastern Europe or Asia can be found online. You cannot rule out finding impurities or poorly-processes capsules in these products. In Germany, production and manufacturing processes for creatine are subject to strict regulations. The German manufacturer Creapure® is the premium brand for creatine and a worldwide market leader. Creatine capsules by Creapure® are characterized by maximized biocompatibility and maximized efficacy. Creatine capsules are ideal for athletes intent on building muscle and gaining weight. Regularly taking creatine and increasing creatine phosphate storage in the body increases the amount of energy available to the body during exercise which it can use to increase strength and improve performance. The effect of taking creatine capsules becomes apparent when doing intense basic training that requires all of the body's strength. That includes bench presses, deadlifts, squats and military presses. In principle, creatine acts as an additional source of energy. Regularly taking creatine capsules replenishes the creatine phosphate stores and supports the formation of ATP (adenosine triphosphate) in the muscle cells. This messenger substance ensures that during short, intense workouts lactic acid does not build up in our muscles prematurely. In addition, there are features relating to the mode of action of the powder in creatine capsules which must be observed. Unlike creatine powder creatine in capsule form is not immediately available to the muscles because it must first "escape" the capsule before being released into the body and the cells. As a result of the longer absorption time, creatine capsules must be taken well in advance of exercise. Only then can the creatine increase your strength and support your performance during your workout. The capsules should be taken at least 60 minutes before training or physical stress. This gives the creatine enough time to complete its route through the body. If you don't time it properly, the effect of the creatine can simply "fizzle out" during your workout. As a result, athletes who don't want to have to plan so far ahead and have the opportunity to prepare themselves shakes should use creatine powder rather than capsules. Creatine capsules are ideal for building muscle and gaining weight. Due to the improved energy supply in the muscle, training plateaus can easily be overcome and you can progressively increase the weight in your weight training in order to build muscle. You can also make a weight gain of 1-2 kilos with the help of creatine capsules. This arises as a result of the increased water retention in the muscles' glycogen stores. Creatine capsules are ideal for athletes who are looking to increase their explosive power, build muscle and gain weight. Thanks to the set dosage and the fact that they can easily be carried around, creatine capsules are ideal for on the go and can easily be kept in your gym bag. It is important to take creatine capsules on non-training days as well. Only then can the body permanently replenish its creatine phosphate stores and provide the necessary energy for an intense workout. The best time to take creatine is in the morning, because the body is also very sensitive to insulin at this time and can swiftly transport the creatine to the muscle cells. Depending on the dosage, 4 creatine capsules should be taken on training days. The body's muscle cells are very sensitive to insulin after stimulation and can transport and absorb creatine better. Overdosing is difficult due to the prescribed quantity of creatine in the capsules. You should, however, stick to the recommended dosage. Depending on the nature of the creatine capsules intolerance can arise as a result of the other ingredients in the capsule. Most creatine capsules are made of gelatin (beef or pork), high-quality products are made from plant-based cellulose capsules. Interactions with or inefficiencies caused by other capsule products or medications are virtually impossible. An adequate intake of fluids is of primary importance when taking creatine on a regular basis. You should drink no less than 2 - 3 liters of water per day. Rare side effects may include nausea, flatulence or diarrhea - but these usually only occur at high doses or during the loading phase, in which large amounts of creatine are taken over a short period. Water retention can have a negative effect on muscle definition - on the other hand, it also increases your power. When buying creatine capsules it is particularly important to ensure that the high-quality raw material Creapure® is used as the base of the product. Creapure® is the German premium brand for creatine products and is renowned worldwide for its high quality standards. You should also make sure that the capsule material is not made from inferior pork gelatin and that no unnecessary artificial coloring or preservatives are added. 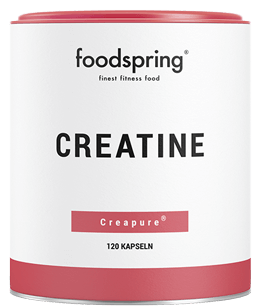 Creatine capsules by foodspring are made using the highest quality raw creatine, from premium German producer Creapure®, which means they can be used in high doses. In addition, the capsules are made from plant-based cellulose fibers and are suitable for vegetarians and vegans. And at foodspring, we don't use any colorants or artificial preservatives in our capsule material. What does Creapure® quality mean? Creapure® is the world’s leading brand of raw materials for creatine, produced in Germany. Creapure offers an extremely high level of purity and maximum bioavailability. Should I use capsules or a powder? The difference between creatine capsules and powders is simply the pharmaceutical form. Creatine capsules are more convenient for use on the go, whereas creatine powder can be added to drinks, such as fruit juices. Both variations have the same effect. Isn’t creatine a type of doping? Creatine is not on the list of doping substances and is also allowed in professional sports. Sometimes low-quality creatine contains traces of anabolic steroids, due to the production process being used. In the worst-case scenario cheap creatine can lead to a positive doping test. But you need not worry if you use high-quality creatine. How long can you take creatine for? Generally speaking, you can take creatine indefinitely. If you do not want to do that, you can try a 12-week cycle, followed by an 8 to 10-week break. Can women also take creatine? Contrary to the widespread belief that creatine is only for bodybuilders and iron pumpers, today creatine is widely accepted as a suitable supplement for any and all athletes who wants to train at a high level. In serious workouts, creatine can improve training performance for speed and endurance and also facilitate regeneration afterwards. That’s why creatine is suitable for anyone who wants to train intensively on a regular basis and quickly achieve their goals. Creatine capsules will be back in stock shortly.